A few of us recently hosted a Mother Blessing for our friend Angela (check out my interview with her here.) A Mother Blessing also known as a Blessingway is a Navajo ceremony, which celebrates a woman's rite of passage into motherhood. It always strikes me at baby showers that we are all but missing the point. Yes, the gifts we give the mother-to-be will no doubt be helpful and appreciated, but what about the elephant in the room - the unrelenting fact that she is about to go through one of the most transformative and challenging events in her life - becoming a mother. We wanted to do things differently especially since she is a single mother and happens to be a bit of a workaholic. We wanted to create an event that she could look to as a reference for strength and support when everything from the labour to the inevitable day-to-day of child rearing gets tough. We asked the incredible Doula, Dr. Nancy Salgueiro (yeah she's my sis) for some guidance. She leads women through these gatherings several times a year and shared with me some of her favourite rituals. We all formed a circle and one by one we would tell the story of how we met Angela. Next, we would share an amusing anecdote or an inspiring story about her. For the amount of years we knew her we would wrap a piece of red yarn (or wool) around our wrist or ankle. The idea is that we keep the yarn around our wrist until we hear Angela is in labour. This way we are reminded that we are with her energetically, giving her strength. We asked everyone to bring a bead (I also had extras.) They were requested to put good energy into the bead and one by one present the bead to Angela while passing one piece of wisdom to the baby in utero. It was beautiful. Many people took the opportunity to place a hand on Angela's belly, and pass some love and light. Angela can now where the necklace as a reminder of her friend's communal encouragement and love while in labour. 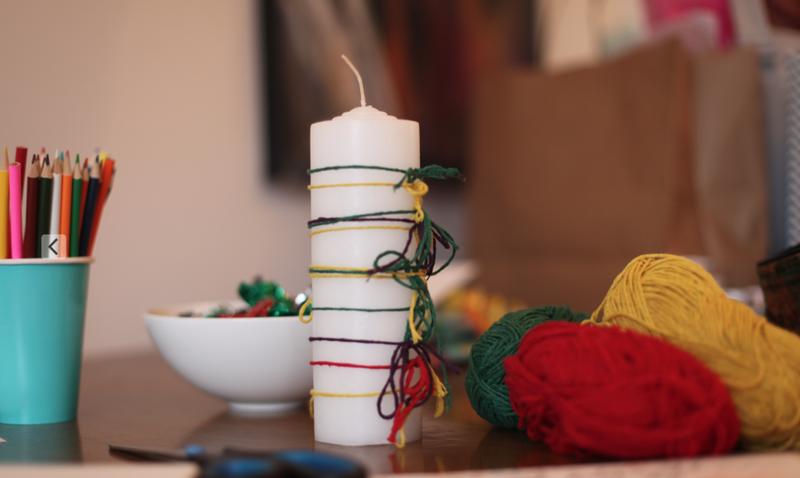 On a table nearby, we asked people to wrap a piece of yarn/wool around a large white candle. This would be given to Angela at the end of the day of her to light while in labour or post labour; again, another reminder of her community back in Toronto. We sent everyone home with a small candle for them to light when they hear the news that she is in labour/has given birth. Another symbol and reminder of our unity. With crayons and markers, we encouraged people to write a message of love for the mother-to-be. Something she can keep with her pre-natal and post-natal and always. It was an incredibly special day, one that Angela said she will never forget. If you or anyone you know is planning a baby shower, I encourage them to explore some of these rituals. We decided not to open gifts together. It felt exclusive and frankly - kinda boring - yeah I said it. Potluck. Ask people to bring a homemade dish. Henna. Everyone takes turns sending love into the Mother's belly. She has the reminder for weeks later while her belly is covered with the beautiful designs of her friends.